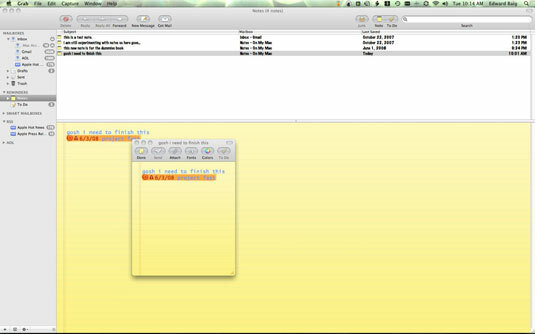 If you frequently e-mail reminders to yourself or jot down thoughts on sticky notes, you’ll like the Notes and To-Do features that Leopard added inside Mail. 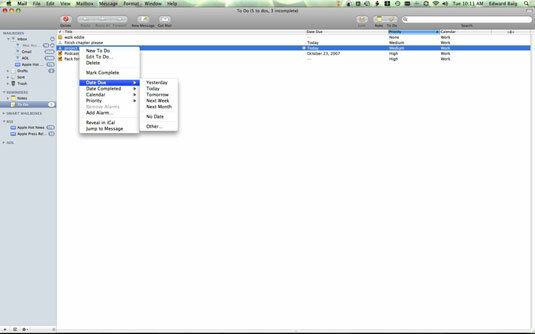 You can even transform a Mac Note into a To-Do item. To create notes inside Mail, just click the Note button inside the Mail viewer window or choose File→New Note. Then just type your thoughts in the lined yellow notebook window. By clicking the appropriate button, you can change the colors and fonts of your note, attach it, or e-mail it. You don’t even have to title for your note because Apple conveniently uses the first line of your note as its subject. Notes are stashed in folders and (if you choose) Smart Mailboxes and readily accessible through the Mail sidebar. And like all the other items on your Mac, you can search them using Spotlight. Creating a to-do is the same as creating a note except you click the To Do button instead. You can transform a note (or a portion of an e-mail message) into a to-do by clicking the To Do button after highlighting the text you want to track. As with notes, to-dos are stored with your Mail. You have several options when creating a to-do: You can set a due date or an alarm, assign priorities (low, medium, high), and add items to iCal. To see these choices, click the arrow to the left of the to-do item (or right-click or Control-click an item in the to-do list). Place a check mark in the little box next to a to-do when you’ve completed a task on your list.